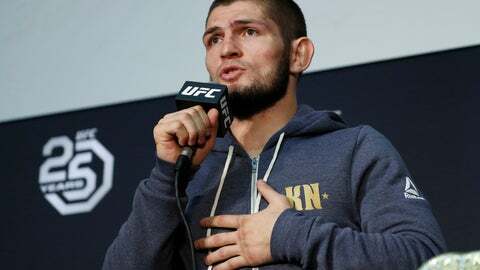 MOSCOW (AP) — UFC champion Khabib Nurmagomedov is probably the best-known Muslim athlete in Russia, and he’s rapidly becoming a leading conservative voice at home. When a National Guardsman was killed while apparently trying to break up a fight outside an establishment variously described as a cafe and nightclub early Sunday morning, Nurmagomedov called for a crackdown on the local nightlife in his mostly-Muslim home region of Dagestan. “What good do these nightclubs bring to our society?” Nurmagomedov posted Monday on Instagram, where he has more than 13 million followers. Nurmagomedov, who lives an alcohol-free lifestyle, beat UFC opponent Conor McGregor last month and helped cause the subsequent brawl, further raising his already-high profile at home. It’s not the first time Nurmagomedov has voiced disapproval of other people’s nightlife choices. “All alcoholics will have the same end,” he wrote after a news conference ahead of the fight against McGregor, who had lambasted him for refusing an offer of whiskey. The Muslim peoples of Russia’s North Caucasus are often marginalized economically and socially in Russia, with higher levels of poverty than the national average and generally conservative views on issues such as women in the workforce. The region’s passion for combat sports offers young men a path to fame — and an audience for their views. Nurmagomedov has repeatedly met with the authoritarian ruler of the neighboring region of Chechnya, Ramzan Kadyrov. Authorities in Chechnya heavily restrict the sale of alcohol, promote an Islamic dress code for women and have been accused of human rights abuses including torture of gay men. Nurmagomedov’s stance on nightclubs has been echoed by Olympic wrestling champion Abdulrashid Sadulaev, nicknamed the “Russian Tank” for his strength in the ring. So far, there’s no sign of a crackdown on nightlife. Regional youth minister Kamil Saidov told the Govorit Moskva radio station that Sunday’s shooting was “an everyday conflict” and said there should be better security, not closures. “If we don’t have places for young people to relax (they’ll leave Dagestan),” he said.